KartHost™ is on our clients’ side! We are now providing free ID Privacy Protection for your domain name WHOIS record legal document. That’s right at no COST! Over the past 18 months we’ve seen a huge increase in mass solicitation towards the owners of new domain names. Owners of domain names that have been recently purchased are getting hounded by domestic and international marketers and many are aggressive. I first found out about this when one of our clients called us saying, “why are you calling us so many times and sending text messages and emails!” You can imagine my confusion, as KartHost™ doesn’t do this type of marketing. One customer accused us (KartHost™) of selling their information, even after we let this customer know what was going on and how these bully marketers were getting their information. Ultimately because of these bully marketers we lost this customer’s business of no fault of our own. Folk’s this just isn’t right to either party! We both lose. Our ID Privacy Protection is handled by a third party, PrivacyProtect.org, a great company out of Massachusetts, USA. KartHost™ has previously been charging an industry low rate of $6.99 a year per domain (compared to GoDaddys’ $7.99-9.99 per year). Starting immediately April 23, 2018, we are offering ID Privacy Protection at NO COST FOR KARTHOST™ CUSTOMERS! That’s right $0 per year, per domain name. If you order a NEW domain name its already included. At KartHost™ we do our best to keep pricing as low as possible. We have kept the .com pricing at a constant price of $12.49/year for the past several years. However, we will need to raise the price on all .coms to $13.89, effective June 1st, 2018. 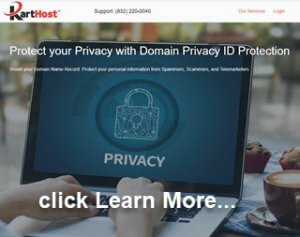 Keep in mind that many of our clients that have ID Privacy Protection on their .com domains will actually see a decrease in yearly pricing, since ID Privacy Protection is now provided to you at NO COST! This is a significant savings. You can beat the price increase by registering or renewing your domain name before June 1, 2018. Please note you can renew your domain name up to 10 years to get the best registration price. Those that have invoices that generated and DUE after June 1, 2018 can pay the invoice before June 1 and get the current renewal price. After June 1st the invoice will reflect the new pricing. Any questions please let us know, we are here to help with Kartnatical Support! Co-Founder and COO of KartHost LLC, KartHost founded in 2000 Retired Commercial Airline Captain. Click Here to find out the history of our business and see why we are the business professionals you need to help build your internet presence.